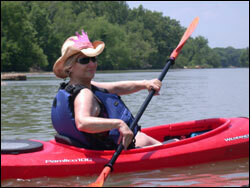 Visit the Bastrop - Wilbarger Paddling Trail in Bastrop, Texas! 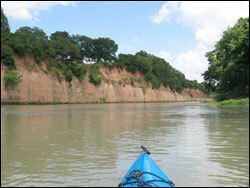 The put-in for this paddling trail is located at the FM 969 Bridge northwest of Bastrop. Take FM 969 north of Highway 71 just past the intersection with FM 1209. The take-out for this paddling trail is located at Fisherman’s Park at the corner of Farm Street and Willow Street in downtown Bastrop. From Highway 71/21 traveling eastbound into Bastrop exit at Texas Hwy 71/21 at “Hassler Blvd, Chandler Street, Loop 150 Exit” and head east (turn left) onto Loop 150 East (Look for “Historic Downtown” sign) and cross the Colorado River Bridge. From Highway 71 traveling westbound into Bastrop, turn right onto Loop 150 and follow it into downtown. From westbound Highway 71 or Highways 21 or 95, head west on Loop 150 West (Chestnut Street) into downtown. Turn north at stop light onto Main Street, and then take a left onto Farm Street. Bear left down to Fisherman’s Park at the fork in the road and the park and boat landing are straight ahead. The upper- and mid-reaches of the river are impounded by six reservoirs, whereas the lower 300 miles of the river is un-impounded and free-flowing below Longhorn Dam. It flows through the cities of Bastrop, La Grange, Columbus, Wharton, and Bay City before entering Matagorda Bay. Though “free-flowing” below Longhorn Dam, flow through this portion of the river is affected by the Highland Lakes, and specifically regulated by Buchanan and Mansfield Dams. As such, the river is readily influenced by rainfall runoff that may create temporary high flows and less desirable water quality conditions. Flow and water quality information is available to paddlers on the web at the LCRA Water Quality Index and waterdata.usgs.gov/tx/nwis/uv?08159200. The Wilbarger Paddling Trail is wide and slow-moving with a few minor rapids but no man-made obstructions, although snags and debris should be avoided. This trail is where the river intersects the Carrizo-Wilcox major aquifer outcrop resulting in unique geological formations and groundwater-surface water exchanges. The flood plain is flat with limestone outcroppings and several exposed cut-banks. Frequent sand bars and islands provide suitable areas for resting. The riparian corridor of the Wilbarger Paddling Trail supports a great diversity of plant and animal life along the river and beyond its banks. Trees to look for include pecan, cottonwood, American sycamore, black willow, bald cypress, hickory, ash, American and cedar elm, roughleaf dogwood, flame-leaf sumac, and red-mulberry. A variety of grasses and vines can be found growing among the trees, while maidenhair fern can be seen clinging to the river banks. Birders can hope to see Crested Caracaras, Ospreys, Red-tailed and Red-shouldered Hawks, kingfishers, vultures, woodpeckers, Great Blue Herons, Wood Ducks, and Killdeer. In the summer, swallows and Purple Martins are abundant. 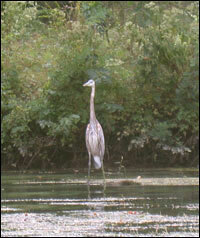 The Wilbarger Paddling Trail also provides unique habitat for the blue sucker, a fish species that is depleted throughout its natural range and is listed as threatened in the state of Texas. The blue sucker is one of the most common fishes in the river between Webberville and Smithville. The Lost Pines Nature Trails site is located on the Colorado River adjacent to the Pines & Prairies Land Trust's River Refuge and serves as an access point for Bastrop Paddling Trails. The paddling trails partners are working with the Water District to improve the site in order to make it more accessible by the public and to provide hike, bike and ADA trails on the 30 acre site. These parks provide opportunities for backpacking, biking (enjoy a 12 mile scenic ride through the Lost Pines of East Central Texas between the two parks), camping, picnicking, canoeing (Bastrop State Park rents canoes), swimming (pool), golfing, wildlife viewing, hiking, and interpretive programs. The Bob Bryant Park is open from 6 am to 10 pm seven days a week. It is located at 600 Charles Boulevard (behind the Riverside Grove Addition). Bastrop is now a growing community with a rich heritage, pines, prairies and a beautiful river valley. There are three 18-hole golf courses within just a few miles of downtown Bastrop, a beautiful State Park and one of the oldest Opera Houses in Texas. Gift and antique stores adorn Main Street. Historical homes add charm and character in and around downtown. For more information about Historic Bastrop visit www.visitbastrop.org. Fisherman’s Park in downtown Bastrop is a nice, new park built in 1994. Located on the banks of the Colorado River, this small park has picnic facilities and access to the river for boats and canoes. You can wade into the river via this paved access, but the water can be swift. Fisherman’s Park has a nature trail and modern playground. Shade is provided by pecans and oaks. Two major Bastrop festivals are held annually at Fisherman's Park—NatureFest held for the first time in November 2007 and the Annual Patriotic Festival which is normally held in July. This trail was made possible through a partnership between Texas Parks and Wildlife Department, City of Bastrop, Bastrop Economic Development Corporation, Bastrop Visitor Center, Rising Phoenix Adventures, Environmental Stewardship, Pines & Prairies Land Trust and LCRA.